How would you like to spend your Christmas? At home with your loved ones, roasting chestnuts by the fire or with strangers on a construction site? Sounds like a no brainer, huh? Read on. In Belize, the law dictates that once an orphan turns sixteen, they can no longer live in an orphanage. In essence, they get kicked out, and have nowhere to go. But you could you help give them a home. Kaya is a charitable organisation that provides travelling opportunities through volunteering. This Christmas you could travel to Belize, see fantastic sites, experience a new culture, and meet new friends. But most importantly of all, you could build homeless orphans a place to live. The project lasts two weeks from 21st December - 5th January. You will travel to a community farm, and during your time there, help build an ecologically friendly home out of sustainable resources such as sandbags and reed composting. 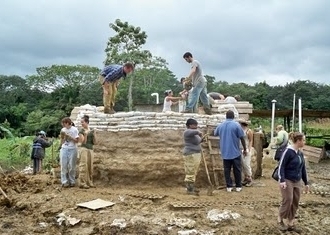 As well as building the actual house, you will be involved in many other aspects, such as fencing, road construction, making waterless composting latrines, and wood conservation stove and ovens. You don't need to have an previous experience, just enthusiasm and the willingness to get your hands dirty. It costs £785 to book, which covers meals, accommodation, and training. Although you will be busy working most of the time, there will be opportunities to explore the surrounding area as well. For example, you can visit the Cockscomb Basin Wildlife Sanctuary and see beautiful jaguars, travel to Glovers Reef, which has a stunning blue lagoon, or go Kayaking on the Belizean Waterways. What you'll probably enjoy most of all, however, is the Christmas and New Year parties, where everyone will celebrate the hard work put in. How would you like to spend your Christmas? At home with your loved ones, roasting chestnuts by the fire or with strangers on a construction site? Sounds like a no brainer, huh?